Could tension between President Trump and North Korean leader Kim Jong-un bring us to the brink of nuclear war? As tensions ramp up, former nuclear war planner and one of the world’s most famous whistleblowers, Daniel Ellsberg, discusses what nuclear war would look like. Could tension between President Trump and North Korean leader Kim Jong-un bring us to the brink of nuclear war? As tensions ramp up, former nuclear war planner and one of the world’s most famous whistleblowers, Daniel Ellsberg, discusses what nuclear war would look like. In 1971, Ellsberg was a high-level defense analyst when he leaked a top-secret report on U.S. involvement in Vietnam to The New York Times and other publications, which came to be known as the Pentagon Papers. He played a key role in ending the Vietnam War. 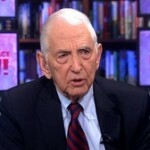 Few know Ellsberg was also a Pentagon and White House consultant who drafted plans for nuclear war. His new book, published Tuesday, is titled “The Doomsday Machine: Confessions of a Nuclear War Planner.” Ellsberg speaks about his top-secret nuclear studies, his front row seat to the Cuban missile crisis, whether Trump could start a nuclear war and how contemporary whistleblowers Chelsea Manning and Ed Snowden are his heroes.